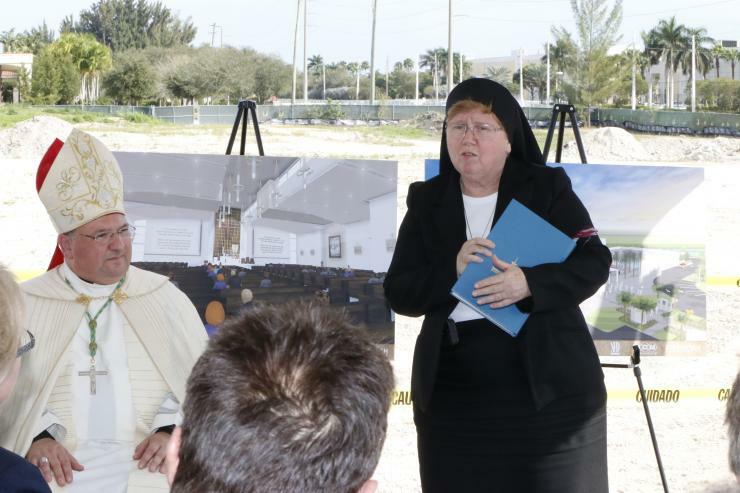 Sister Elizabeth Worley, archdiocesan chancellor for administration, addresses guests at the groundbreaking for Our Lady of Guadalupe's new church. "We are thrilled to be in the position of building churches, of building the city of God," she said. Architect Jose Murguido of Zyscovich Architects, credits the Holy Spirit with being his partner in the design of Our Lady of Guadalupe Church. Juan Munilla of MCM Construction speaks at the grounbreaking. His company has taken on the responsibility of completing the project by the feast of Our Lady of Guadalupe, Dec. 12, 2015. Auxiliary Bishop Peter Baldacchino speaks before blessing the ground where the church of Our Lady of Guadalupe will be built. With him are Father Israel Mago, pastor, and Sister Elizabeth Worley, archdiocesan chancellor for administration. 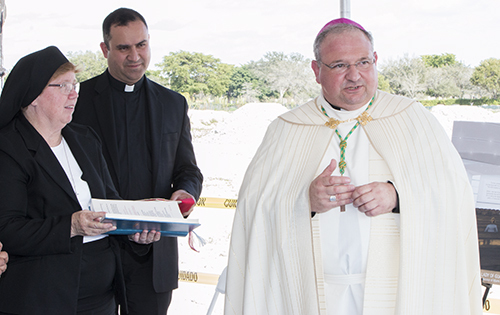 Auxiliary Bishop Peter Baldacchino blesses the ground where Our Lady of Guadalupe Church will be built. Helping him is Father Israel Mago, the church's pastor. 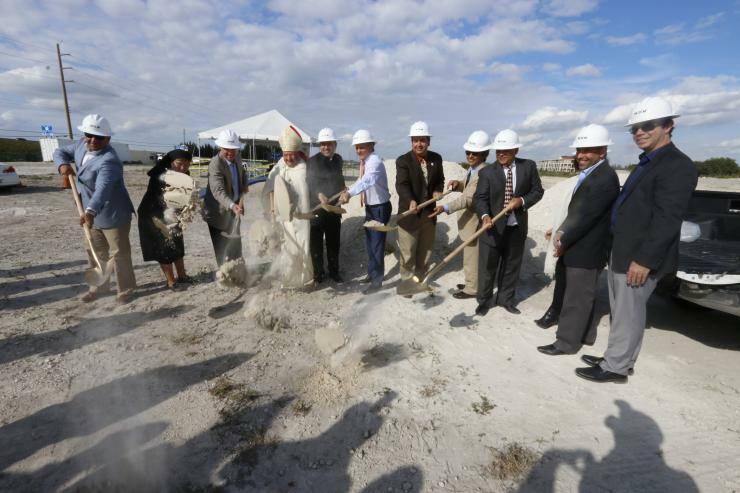 Key officials from the archdiocese, the city of Doral, Zyscovich Architects and MCM Construction use golden shovels to turn over spades of dirt on the site of the future church of Our Lady of Guadalupe in Doral. Beginning second from left: Sister Elizabeth Worley, archdiocesan chancellor for administration; Juan Munilla, principal of MCM Construction; Auxiliary Bishop Peter Baldacchino; Father Israel Mago, pastor; Luigi Boria, Doral mayor; David Prada, director of the archdiocese's Building and Property Office; Jose Murguido, principal of Zyscovich Architects; and Orlando Sharpe, president of Sharpe Project Developments. 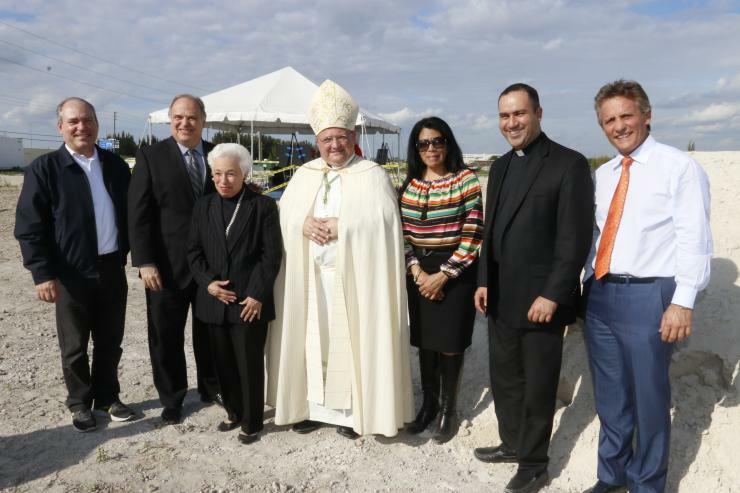 Posing for a photo after the groundbreaking, from left: Our Lady of Guadalupe founding parishioners Andrea Salani, Juan Carlos Bermudez, former mayor of Doral, and Barbara Romani; Auxiliary Bishop Peter Baldacchino; founding parishioner Dina Mitjans; pastor Father Israel Mago; and current Doral Mayor Luigi Boria. 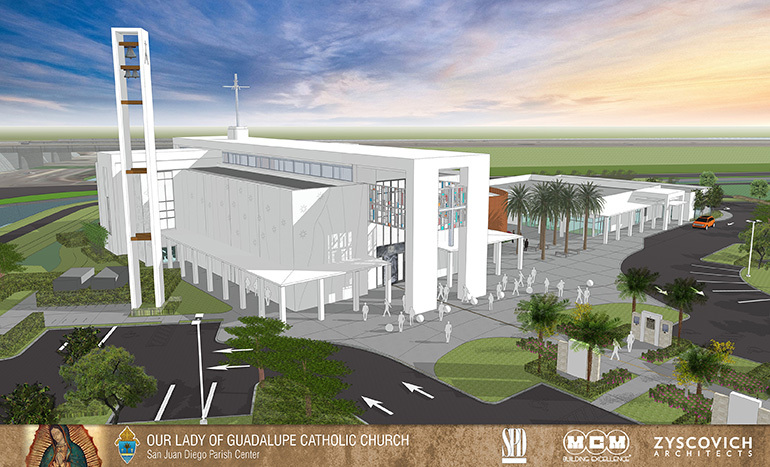 Architect's rendering of Our Lady of Guadalupe Church, with chapel and multipurpose building, which is slated to be dedicated on the feast day of Guadalupe, Dec. 12, 2015. 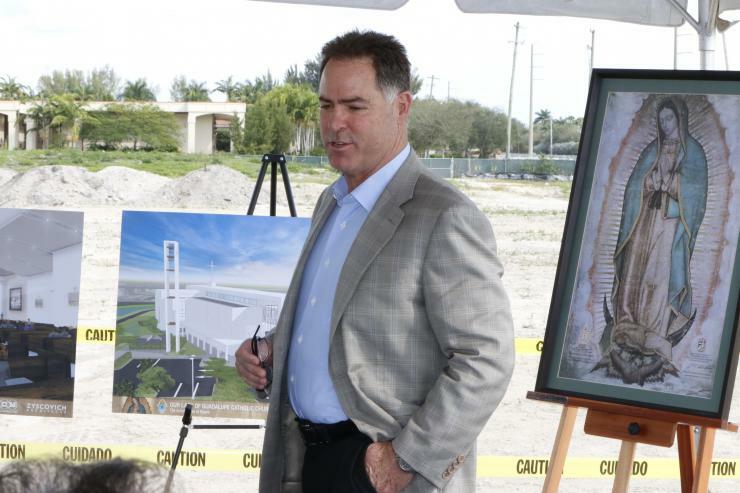 DORAL | A miracle is coming, and the date is set: Dec. 12, 2015. 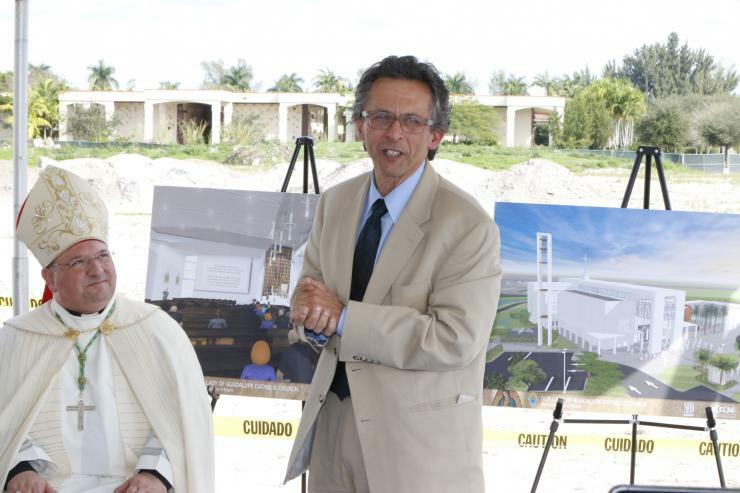 That’s when parishioners of Our Lady of Guadalupe in Doral plan to dedicate their new church, chapel, and multipurpose building, going in less than 15 years from a community without a home to one with a completely built parish plant. Indeed, the usual pattern is for a parish to build a multipurpose building first, then turn it into a parish hall years later, when a permanent church is built. Later on, some add a chapel for daily worship and adoration. Auxiliary Bishop Peter Baldacchino speaks before blessing the ground where the church of Our Lady of Guadalupe will be built. With him are Father Israel Mago, pastor, and Sister Elizabeth Worley, archdiocesan chancellor for administration. That was the plan for Our Lady of Guadalupe, which began in 1999 as a mission of Blessed Trinity in Miami Springs and became a parish in 2001. But after a dozen years of stops and starts, including two groundbreakings and a lengthy search for a parcel of open land, the new plan is to have all three buildings completed in less than a year — just in time to celebrate the feast day of their patroness, also the patroness of the Americas. 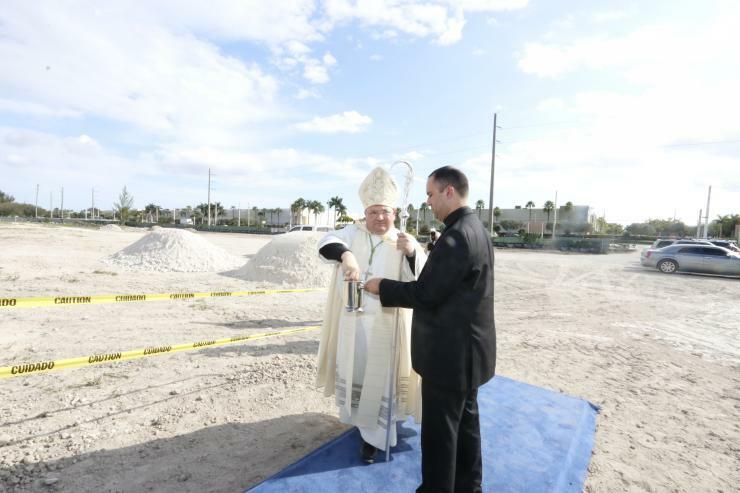 “Ultimately you realize that this is really what Guadalupe wanted,” said Father Israel Mago, pastor, during the third — and final — groundbreaking ceremony, a low-key affair held Jan. 9 on a white-sand lot along N.W. 25th Street, just west of Our Lady of Mercy Cemetery and east of the Florida Turnpike. The 13.5 acre site was donated to the parish by the cemetery, after founding pastor Msgr. 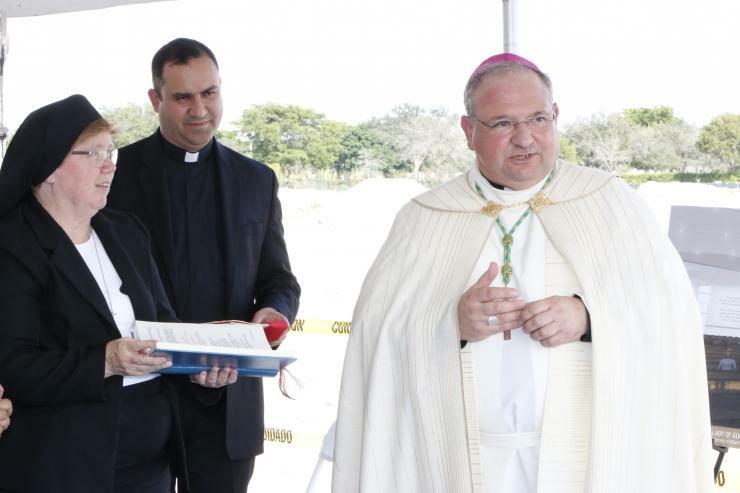 Tomás Marín (now pastor of St. Timothy in Miami), could find no open plot of land in the fast-growing city of Doral. Once he had the land, he held a groundbreaking (in 2008), and began raising funds and making plans for a multi-purpose building. Both his plans and Father Mago’s initial plans fell through, however, and to this day the parish’s 5,000 or so registered families celebrate Sunday Masses in the auditorium of Doral Academy High School. The breakthrough came a couple of years ago, in the form of an anonymous donor — a devotee of Our Lady of Guadalupe — who offered to give $2 for every $1 that parishioners contributed to the building fund. That’s when Father Mago and his community realized they could build the whole parish plant all at once for about $12 million — an amount they are about halfway toward collecting. “There have been a lot of God-incidences throughout this project,” admitted David Prada, archdiocesan director of the Office of Building and Property. Among them: construction permits were pulled on the feast day of Guadalupe, Dec. 12, 2014. Prada sees parallels in the story of San Juan Diego, who tried several times, unsuccessfully, to convince the local bishop that Mary had appeared to him and wanted a church built on that hill in Tepeyac. Only when the flowers fell from his tilma (cloak) — revealing her image on the cloth — did the bishop believe him and do as Mary asked. That’s why the architect, Jose Murguido of Zyscovich Architects, brought a bunch of red roses to the groundbreaking. That’s not the case at Our Lady of Guadalupe, which has 5,000 registered families. Still, a lot of work remains to be done in a very short time. Anyone interested in helping Our Lady of Guadalupe’s parishioners make their dream come true is asked to call the church office, 305-593-6123. 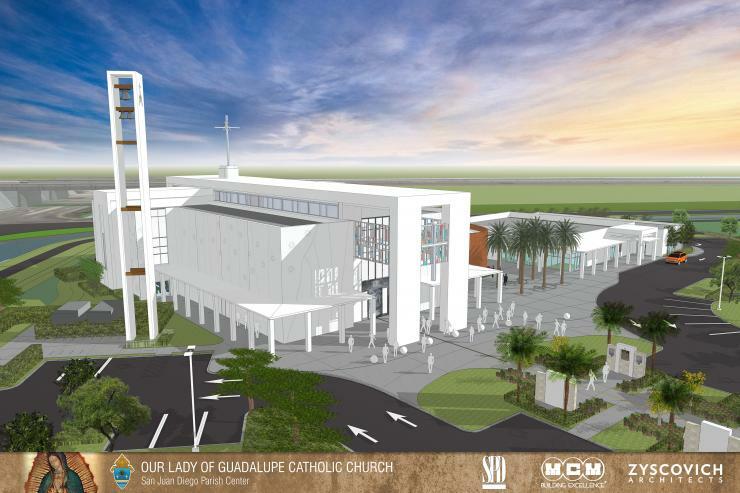 Architect's rendering of Our Lady of Guadalupe Church, with chapel and multipurpose building, which is slated to be dedicated on the feast day of Guadalupe, Dec. 12, 2015. Congratulations to all involved in this wonderful progress. I am surprised not to find Msgr. Tom�s Marin featured in the photos. I know how much of the initial success should be attributed to him. The framed image of Our Lady in one of the photos is one of those images that were sent to the Archdiocese by the Rector of the shrine of Guadalupe in Mexico City and that was part of the pilgrimage that the image made from parish to parish at the time of the Jubilee.